The only constant in life is change. We’ve all heard that, but few of us have internalized it to the point where change is no longer threatening. Embracing change rather than fearing it is the first step to understanding that our life is meant to be an adventure. Tolstoy has it absolutely correct. We need to live on the edge, always looking forward to the next opportunity to see and experience what is on the other side. As long as we live we will be immersed in change. And that’s o.k. That’s as it should be. Accept it. 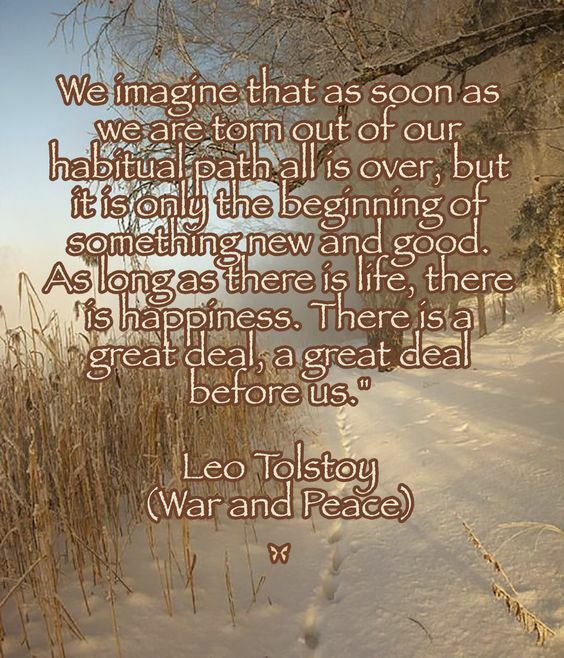 This entry was posted in News & Views, Quotes and tagged acceptance, adventure, change, edge, evil, expectancy, good, habit, happiness, hope, Leo Tolstoy, life, newness, reminder, threat, War and Peace on November 12, 2016 by Ray Buchanan.